The 5G Playground is a live R&D testbed were researchers and engineers are able to bring their own prototypes and build together the 5G environment. It enables the evaluation, validation, interoperability and demonstration in a comprehensive environment, for new ideas, prototypes and solutions. OpenSDNCore, a practical implementation of Network Functions Virtualization (NFV) and Software Defined Networks (SDN) paradigms, aiming at virtual functions deployments on top of carrier-grade, cloud based infrastructures. Open5GMTC, an R&D prototype, providing advanced features for device and connectivity management of a very large number of wireless devices (human controlled or machines). The competence center NGNI of Fraunhofer FOKSU and the chair AV of TU Berlin are developing the new OpenSDNCore toolkit to investigate the potential, opportunities and challenges on applying SDN principles on telecommunication networks. Continuing the 3GPP EPC control and data plane split further on in the packet core gateways. Separating forwarding functionalities from the gateways in the user plane part of the gateway and the control and management functions in the control part of the gateway. Enablement of network-aware services and core network enhancements for service-awareness for networks. Using the flexibility of SDN to enhance the 3GPP PCC functionalities. 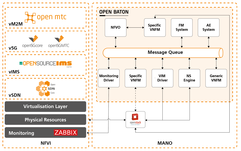 Flexible Traffic Management including Adaptive Flow Placement and Elastic Network Design. Flexible access- and core network topology management for supporting Self-Organizing-Network (SON) concepts and enabling smart resource control. Applying SDN concepts on the telecommunication networks enables flexibility on the data plane and increases the performance at the same time. Current resource limitations in today’s networks are addressed through this approach. Fraunhofer FOKUS and TU Berlin are developing OpenFlow support within the OpenEPC for validating and proof the presented concept.